Shivaram Hari Rajguru (24 August 1908 - 23 March 1931) an agitated Indian freedom fighter took to revolutionary ideology to fight against the British who had taken over India and had been exploiting Indian lands, insulting Indians by way of dissemination and were responsible for pushing the Indian economy to the lowest level. They, during their occupation, vastly improved the British economy at the cost of Indian suffering. In the late 19th century and early 20th century, there arose several groups of Indians across India, burning with patriotic zeal, who took to violence as a last recourse to deal with repressive British officers. Rajguru, hailing from Maharashtra, is known mainly for his involvement in the assassination of a British Raj police officer. Being an adult charged with evolutionary mind, it is quite obvious, he was drawn to the Hindustan Socialist Republican Army (HSRA) that wanted free India to be ruled by Indians and were resolute to achieve their goal at any cost. Rajguru became a good marksman and could handle guns well. Rajguru, like countless revolutionaries. strongly believed that the the nonviolent civil disobedience preferred by Mahatma Gandhi won't make a dent in the obdurate British mind believed that ferocity and letting loose terror against the oppressors would be far more effective against British rule than Gandhi's Satyagraha that might be self-defeating and would yield little results. HSRA organization made their presence felt in many places as the members of this group wee inspiring Indians, the British kept an eye on them. The Lahore Conspiracy Case (December 18, 1928) and the bombing of the Central Assembly Hall in New Delhi (April 8, 1929) are cases in point. Being a courageous man he was willing to do any sacrifice to free India from vice-like grip the British had on India and its people. Only free India became his watch word. Rajguru joined the group of Bhagat Singh, Sukhdev and Chandeasekara Asad and they were mostly operating in Punjab and UP with with Kanpur, Agra and Lahore as his headquarters. and took part in the assassination of a British police officer, J. P. Saunders, at Lahore in 1928. It was a premeditated attack on the police officer and it was done to avenge the death of an eminent freedom fighter Lala Lajpat Rai who died a fortnight later after he had been hit by police while participating in a protest march against the Simon Commission. The public opinion was that Rai's death was due to police brutality. Chandrashekhar Azad, Shivram Rajguru, Bhagat Singh and Jai Gopal were given the task of killing the British police officer who ordered the lathi-charge purportedly John Saunders? On 17th December 1928, while Saunders came out of his office and started his motor-cycle, he was shot dead in front of the police headquarters at Lahore by Rajguru. Shivaram Rajguru, along with Sukhdev Thapar, who was the accomplice of the legendary Bhagat Singh, spearheaded the attack. Rajguru then went into hiding in Nagpur. On his travel to Pune, Shivaram Rajguru was finally arrested. Bhagat Singh, Shivaram Rajguru and Sukhdev Thapar were then convicted of their crime and sentenced to death. Paradoxically, their target was senior Police officer James Scott who had ordered his men to lathi-charge the protesting group against the Simon Commission (1927) that visited India to discuss Indian political reforms. The commission did not include any Indian member that infuriated the Indian leaders across India. It was yet another insult on the Indians by the Raj. The three men and 21 other co-conspirators were tried under the provisions of a regulation that was introduced in 1930 specifically for that purpose. All three were convicted of the charges. The Tribune in its front pages announced the executions of Rajguru and others scheduled for hanging on 24th March, Three activists were hanged a day earlier on 23 March 1931. They were cremated at Hussainiwala at the banks of the Sutlej river in the Ferozepur district of Punjab. 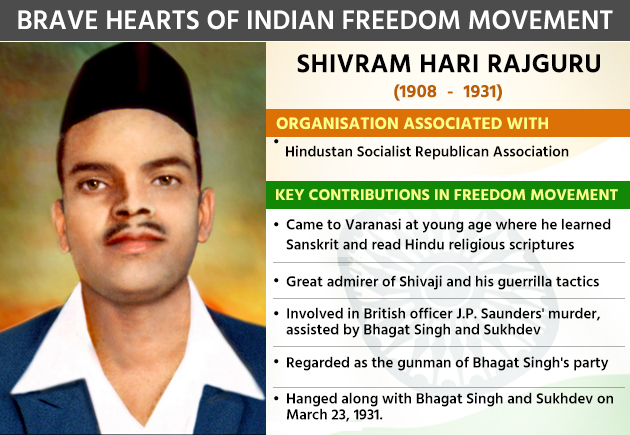 Shivaram Rajguru was too young to die just only 22 years old at the time of his execution: he became a young martyr like Bhagat Singh.